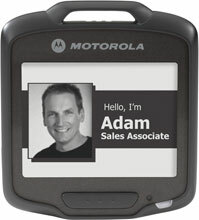 Smart Badge, E Ink Display, 80211b/g/n Wi-Fi, Omnidirectional 1D/2D Scanning, Push-to-Talk Single unit. Interface Cables And Charging Cradle Sold Separately. LIKE NEW. SB1 Smart Badge, E Ink Display, 80211b/g/n Wi-Fi, Omnidirectional 1D/2D Scanning, Push-to-Talk Single unit. Interface Cables And Charging Cradle Sold Separately.